I must give my mother credit, she wasn’t the typical Italian-American mom that only cooked what she learned from her mother, she tried many different types of dishes. 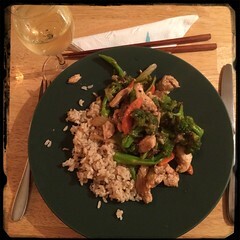 An example would be her attempt creating Asian-American cuisine such as Chow-Mein and the following recipe for Asian-Style Chicken with Broccoli. Her attempts making different ethnic food helped me appreciate international foods and more importantly, other cultures. Thanks Mom! *Don’t throw away the stems! Cut the stems of the Broccoli into 1/4 inch slices. Marinate in a bit of white wine (or sherry) a dash of soy sauce, a bit of teriyaki sauce and 1 tbsp sesame oil. 1. In a large heavy-skillet (or wok) heat 2 tbsp grape seed or peanut oil. Add the Chicken and cook over medium heat, stirring constantly until the chicken is cooked on all sides (and it loses it’s translucence, about 5 minutes) Sprinkle with some salt and white pepper. 2. Add the carrots and celery, let cook for a few minutes. 4. Add the lemon juice and cornstarch mixture, cook until sauce is thickened and clear (stirring constantly). Add a bit more stock or water if desired to obtain the consistency you prefer. Serve with rice or Asian-style noodles.